Squirrels are extremely intelligent creatures. They are known to put on elaborate bogus food burying displays to deceive onlookers. The fake burials are to trick potential thieves, such as other squirrels or birds, into thinking that they have stored their food stock there. Any observers planning on taking the stash will then focus on the bogus burial site, allowing the squirrel to bury the real stash elsewhere safely. When a squirrel is scared and feels that it is in danger, it will at first remain motionless. If it is on the ground, it will run to a nearby tree and climb to safety, and if it is already in a tree it will circle the trunk and press up against the bark tightly with its body. Squirrels are very trusting animals, and are of the very few wild animal species which will eat out of a person’s hand. Squirrels communicate with each other through various vocalizations and scent marking. 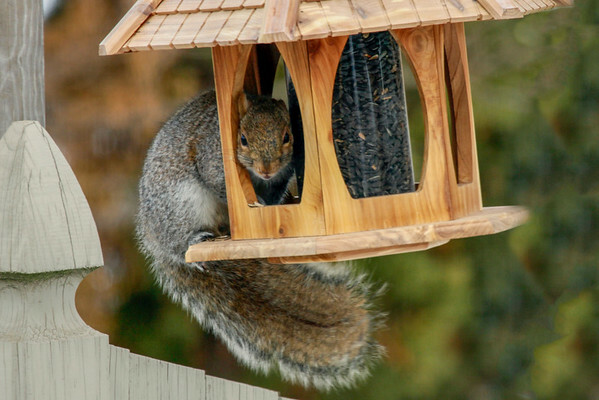 They also use their tails as a signalling device, twitching it when uneasy to alert other squirrels of potential danger.